Pieces make their journey to The Center from all across the country through a variety of methods. Our account managers and art handlers work closely with each client to determine the transportation method that is best for their pieces. From local drop-offs to large-scale moves, we consider the material, scale, and location of each piece in order to ensure the work arrives safely at The Center. For collections that are fragile, valuable, or affected by disasters, The Center provides hands-on assistance with organizing efficient and safe transportation. Our conservators, registrars, art handlers, and account managers travel frequently to prepare and pack works for transport. Once pieces are safely wrapped, we shuttle them to The Center via art handlers in climate-controlled, secure, air-ride trucks. Regardless of what method is used to transport pieces to The Center, our organization process begins long before the works arrive. For larger collections, the first step is to inventory all items on-site. This process includes photographs, dimensions, and detailed notes on any preexisting condition issues. 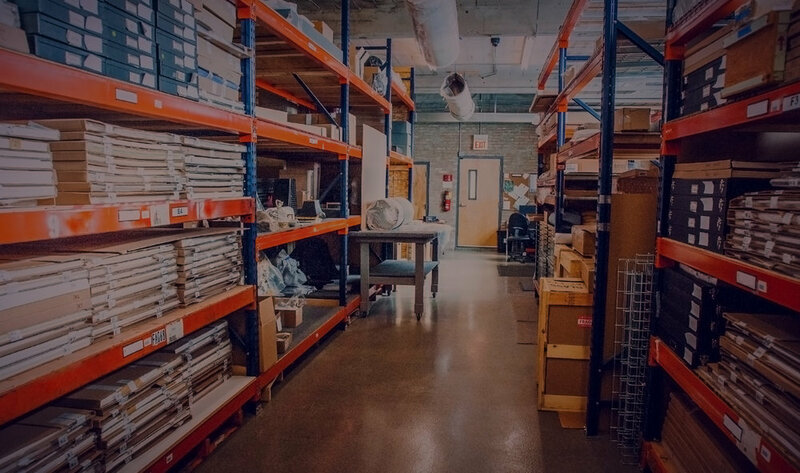 The on-site inventory list is then sent to The Center so we can preemptively enter the items into our custom-built database under the appropriate client name. This system allows us to output individually bar-coded labels for each piece before it arrives. The bar-codes and inventory lists are then referenced carefully as each piece is removed from the truck after it arrives at The Center. The first to be unpacked are the priority items. A priority item, according to one of our registrars, is an item that has been affected by "anything that can continue damaging the artwork unless taken care of immediately." Examples include pieces with severe water damage, active mold, or heavy soot, which are common conditions among collections affected in the recent natural disasters. In such situations, our team swiftly springs into action to triage the works. This consists of immediate, on-the-spot treatment to stabilize the pieces as best as possible. Depending on the situation, our conservators may even conduct triage onsite prior to transportation. Regardless of if it is an item in need of triage or not, once an object is unpacked from the trucks its location is immediately updated in our system. Next, our photographer takes high-resolution "before" photographs of each piece. After the information is updated in our database, the piece is brought to the appropriate conservation department within our facility, where a specialist will provide a condition report and a proposal for treatment. These proposals include suggested methods of care and the anticipated materials to be used. The conservators then estimate the treatment time of the object and approximate cost of the overall project. While priority items are cared for immediately, other items are stored in our climate controlled facilities until an examination can be completed and conservation can begin. Our photographer continues to work closely with our conservators to trace the journey of each piece, sometimes from the very beginning as we unpack an item from its shipping crate. Our photographer also often takes photographs during treatment for in-house documentation. Our registrars and art handlers also work closely with conservators to handle and care for each work from arrival to departure, ensuring that several sets of eyes are put on each piece to check for quality control before the work is carefully wrapped and transported safely back home.